Plant growth promoting bacteria (PGPB) enhance crop productivity as part of green technology to reduce the use of chemical fertilizers. They also have the capability to enhance macro- and micronutrient content of plants. In the present study, PGPB isolates belonging to Pseudomonas citronellis (PC), Pseudomonas sp. RA6, Serratia sp. S2, Serratia marcescens CDP13, and Frateuria aurantia (Symbion-K) were tested on two chickpea varieties, PBG1 and PBG5 grown for 30 days in local soil from Bathinda region in Northwestern India. PC and CDP13 were found to be better chickpea growth stimulators compared to the commercial Symbion-K based on shoot length and biomass. Most PGPB enhanced macro- and micronutrients in shoots to varying degrees compared to the control. 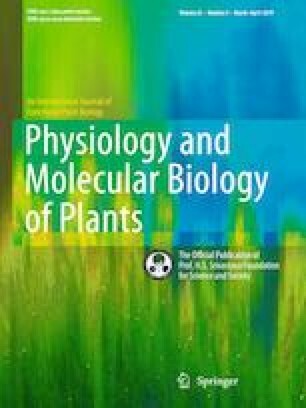 PBG5 gave better response compared to PBG1 with reference to plant growth attributes and enhancement of the macronutrients, calcium, nitrogen and phosphorus and micronutrients, boron, copper, iron, and zinc. PBG5 is a high yielding variety with better resistance compared to PBG1. Overall, PGPB isolated from the local soil and PGPB from other parts of India were shown to be useful for enhancement of nutrient content and plant growth. The online version of this article ( https://doi.org/10.1007/s12298-019-00661-9) contains supplementary material, which is available to authorized users. Nitin Dogra and Radheshyam Yadav have contributed equally to this work. We acknowledge research funding for this project by the Central University of Punjab to Wusirika Ramakrishna and Council of Scientific and Industrial Research (CSIR)-University Grants Commission (UGC) junior research fellowships to Radheshyam Yadav and Arindam Adhikary. We thank Ravishankar Kumar and Dr. Sunil Mittal for help with nitrogen and phosphorus estimation.